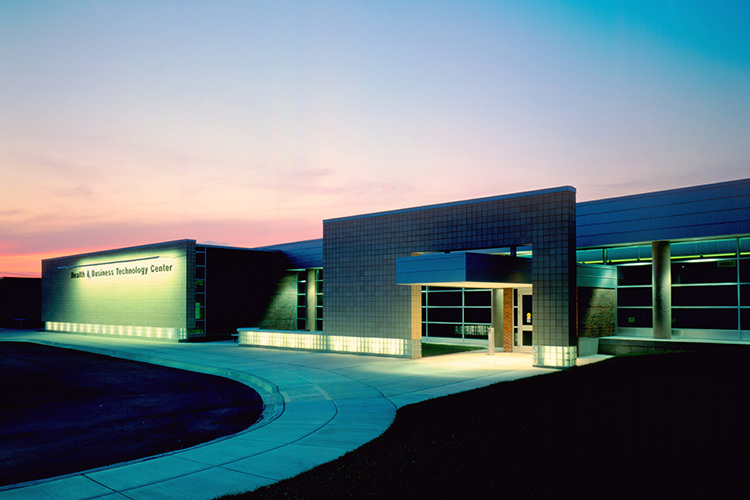 Kluber Architects + Engineers designed the new Health and Business Technology Center with the desire to incorporate an existing campus building into a larger college architectural plan to connect all buildings on the Elgin Community College campus internally. The interior space of an existing maintenance garage was converted into classrooms, while exterior brick was substituted to match adjacent structures. The front façade was designed with an angled wall, which incorporated a common design theme in place throughout the campus. The wall gives excitement to the streetscape at night.